An old favourite of anthropological romanticism hit the news this week, with the release of a new set of photos of one of the “uncontacted tribes” in the Brazilian rainforest whose existence is under threat from illegal logging. This coincides with the broadcast of the jungles episode of BBC pop-anth documentary Human Planet during the filming of which the photos and some footage of the tribe were taken. Now it’s not often that one gets a glimpse into life in the depths of the uncharted Amazon and as such I think these photos are an amazing cultural artefact. I also understand why (given that accusations have often been made that these tribes don’t exist) the Brazilian government and the NGOs they work in conjunction with feel the need to collect and publish them in order to raise awareness of the potential impact of the encroachment of logging activities into these areas. However, there some issues about the use of photos like this that unnerve me quite a bit at the same time*. 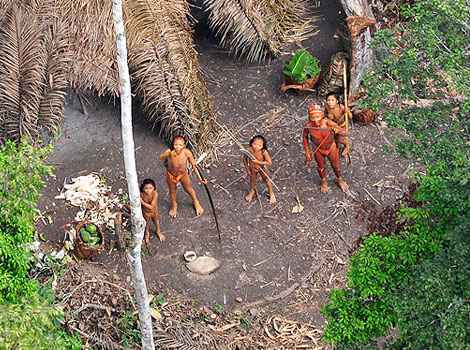 An aerial photo of an “uncontacted” tribe, taken for the Brazilian government by the BBC’s Human Planet team. Both the Brazilian Government and the agencies that have been appointed responsibility for the protection of this particular group state explicitly that the people concerned have made it obvious that they do not wish to make contact with “wider society” and want to be left alone. Given that this is the case, the very act of recording their images and displaying them to the world seems a bit hypocritical and invasive of their desired privacy. Of course, this is not to assume that these Amazonian people have the same social constructs as us with regards to privacy, etc. – but we just have no way of establishing whether or not they would give their consent to having their photos taken and published, if it were possible to ask. At the same time, the way the photos are used, particularly by the mainstream media in Europe and North America, are to “other” the people who appear in them – we can in fact gain very little understanding of the context of their lives from the photos, but we can marvel at how different their lives appear. This may help sell papers and boost charitable donations, but in my opinion it also gives the photos an uncomfortable zoo-like quality and isn’t likely to help increase anyone’s anthropological understanding in a positive way without a lot of context. Equally problematic is the use of the term “uncontacted” to describe them. As NGO Survival International readily admits, this does not mean that they live in total isolation from contact with any other group – they exist in a network of relationships with other local tribal groups, and may in the past have had some form of negative contact with colonist society. Because of this, SI’s specific definition of “uncontacted” is “Peoples who have no peaceful contact with anyone in the mainstream or dominant society”. There are two issues here – firstly that even when a specific definition like that is used by one agency, the term “uncontacted” is already loaded and will be open to misinterpretation and sensationalism, particularly when picked up by the mainstream media. But secondly, and most worryingly, the term “uncontacted” sets up a typical “us and them” distinction that, like the photos themselves, encourages the unhelpful perception of such peoples as somehow “exotic” or “other”. “Uncontacted” doesn’t mean uncontaced by anyone, but uncontacted by us or people like us – Westerners, the Global North, EuroAmericans, “mainstream or dominant society”. The contact that “uncontacted peoples” have with other tribes in their area (and there are always complex networks of social exchange) is rendered irrelevant by this definition, even though it’s likely to be most relevant for them. So not only is the most isolated of the tribes othered, but also other tribes in their area – even those whose own networks of contacts may indeed extend into “mainstream society”. Sadly, establishing this binary of difference is rarely helpful for the agency and empowerment of the people involved, particularly when they are on the receiving end of outside intervention; even that intended to protect their way of life. If you’re interested in reading further on the issues, there’s a great article at Savage Minds. And you should definitely check out the Survival International website – I may have reservations over their choice of language, but they do do very good work promoting the human rights of indigenous peoples. *And yes, before you ask, I am aware of the irony of problematising these kinds of photo at the same time as sticking one in this blog post for people to see.